On Monday a force of thugs and scabs attacked the union hall under the gaze of the police with a hail of missiles. A plug of gelignite was thrown, exploding just outside the hall entrance. The windows were smashed. The attackers broke in to besiege a group of unionists in the committee room. After a while the police called the violence off and the unionists made their escape, only one being caught and beaten up. On Black Tuesday… the police and scabs attacked. The unionists were not able to bolt the door in time. There were gun shots as thugs and police broke in and the unionists fled through the back way. The scabs and a notorious thug fell upon the stricken union man (pp. 33-4). These events didn’t happen in some far-off country but in the small town of Waihi one hundred years ago. The victim was Frederick Evans. His death was the first of a New Zealand worker on the picket line (and the only one until Christine Clarke was killed in 1999). The defeat of the goldfield strike initiated a turning point of such immense political significance that its effects echoed for decades after. The lessons to be drawn from the strike are profound and are still vitally relevant to the working class movement today… Setbacks are an unavoidable part of the working class’s experience, and there is no escaping the fact that Waihi was a crushing defeat. 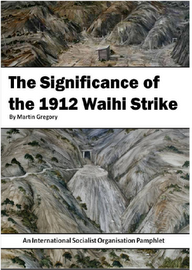 The significance of the Waihi Strike lies in the conclusions that were drawn from the intervention of the state. They were to greatly affect the future course of working class organisation and the history of New Zealand. The strike marks a real turning point (pp. 4, 35). In 1894 the Liberal Party Government had passed the Arbitration Act, giving registered unions official recognition but also binding them to the Arbitration Court’s decisions as well as forcing workers to fight employers in the courts where the employers and state were at their strongest. Strikes were outlawed. Arbitration was initially popular with workers as it led to improvements in pay and conditions, but inevitably over the long term it favoured employers. The first serious challenge to Arbitration came with the successful Blackball miners‘ strike in 1908, leading to the formation of the Federation of Mineworkers, the forerunner of the “Red” Federation of Labour or FOL. The Waihi miners worked under a competitive contract system that set miner against fellow miner. It was said that a miner had a useful working life of about fifteen years – but it was a hugely profitable life for the mine owners. In early 1911, the powerful Waihi Workers’ Union (WWU) achieved the absolute majority it needed to escape Compulsory Arbitration by cancelling its registration under the system. 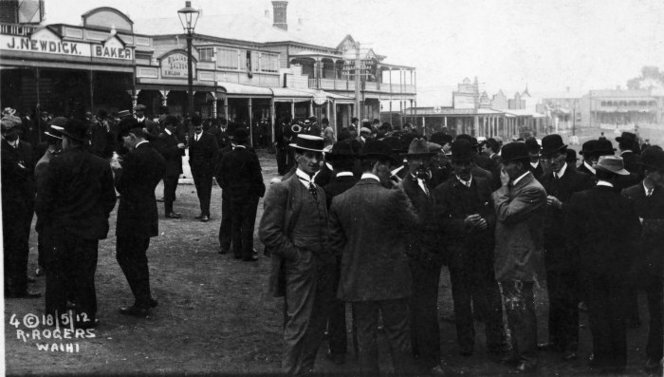 As a direct result the miners’ working conditions greatly improved – but these gains could all be lost if a rival union was registered under the Arbitration system: If just fifteen members could be found it would become the officially recognised union – and the Arbitration Court’s decisions would be binding on all 1,200 Waihi miners. On May 11, 1912, the mining companies succeeded in doing just that. The following day the WWU executive made the momentous decision to send an ultimatum to the mining companies demanding that they disband the new union. Many of the miners’ leaders were influenced by “syndicalist“ ideas, particularly those of the American Industrial Workers of the World (the IWW or “Wobblies”). Syndicalism emphasised the key role of the strike and a “whole class” outlook as opposed to that of the narrower craft unions. The FOL was closely linked to the supposedly revolutionary NZ Socialist Party. As Martin correctly points out in his pamphlet, understanding the politics of this organisation is key to understanding the politics and tactics of the strike itself – and its outcome. The party was split into several political currents, expressing a range of both revolutionary and reformist positions – though in practice it was the parliamentary arena to which the Socialist Party’s leaders devoted most attention. This factionalism led to increasing dissatisfaction within the party, with some leaving to join the Wobblies. Although the Socialist Party’s leaders espoused revolutionary socialist positions, in practice they avoided strikes where possible, seeing them as a threat to the party’s growth. During 1912 the party was unable to offer revolutionary leadership and its members would instead look to the IWW for leadership and ideas. Along with the NZ Socialist Party there was also the United Labour Party, constituting the formally more moderate wing of the labour movement at the time. Meanwhile the Federation of Labour leadership equivocated in its support for the Waihi miners. After they failed in negotiations with the mining companies, pressure from members led to a new constitution modelled on the IWW’s being adopted: “including the rhetorical gesture that was the splendid revolutionary syndicalist IWW preamble“ (p. 23). Both the majority position of inaction and the IWW fetishist demand for an immediate general strike were faulty. The working class is not a stage army. A general strike cannot be conjured up without a broad-based head of steam for action. The call for an immediate general strike from the Federation conference was unrealistic even for Federation unions, let alone the unaffiliated (p. 24). The Federation had missed an opportunity to broaden the strike beginning with other mine workers, and while the mining companies had no intention of letting legal niceties get in the way of defeating the miners, there was uneven support for the mine workers, with the “moderate” ULP actively opposing the strike and even helping to organise scab labour. As Socialist Party member and future Labour leader Harry Holland put it: “Thus the Federation of Labour was fighting directly the Gold–mine Owners’ Association and the Employers’ Federation, and secondly the scabs, the press, ruling class law and its Massey Government, and the United Labour Party” (p. 27). Between the strike’s beginning in May 1912 and August that year, attempts to alternately starve then divide the workers had failed. In August the companies began recruiting strikebreakers and the following month police stepped up confrontation with the miners. Strikers were jailed, gaining more widespread working class support. A scab union was formed with the intention of forcibly reopening the mine. The editor of the United Labour Party’s newspaper went to Waihi to help organise the scab union. On the back foot, the Federation of Labour called a general strike in October. It failed to win support beyond the miners due to the FOL’s inept handling of earlier disputes. 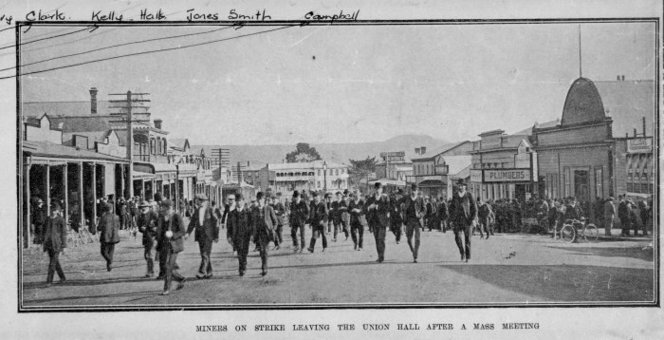 By early November there were over a hundred strikebreakers working the Waihi mines, and police violence against the strikers increased. The author gives a vivid account of the events of Black Tuesday and their aftermath. Nine thousand would attend Evans’ funeral in Auckland. Strike leaders were run out of town. The strike was now effectively over, though not officially called off until the end of November. By the end of the year the competitive contract system was reinstated. Violence against the strikers and the government’s failure to hold an official inquiry caused outrage amongst the working class. Much of the ULP membership shifted to the left, repudiating strikebreaking. However the main lesson drawn by the Federation of Labour’s executive was that the government had to be fought politically (i.e. through elections) rather than by direct action. The real tragedy of the Waihi Strike is that a generation of revolutionary socialists rebounded from the industrial defeat to retreat into reformism. The significance of the eclipse of the Socialist Party is incalculable for what might have been. What is certain is that reformist politics was strengthened immensely by the liquidation of its revolutionary rival. Reformism gained a cohort of activists with enormous authority within the working class and the standing of the leftist leaders would grow. These and other former revolutionaries became leaders of the Labour Party. Compared to today’s Labour careerists they were giants, but they became shadows of their former revolutionary selves, Red Feds, once feared by the capitalist class (pp. 43-4). The reformists’ fear of “scaring off” supporters by being “too militant”, and their focus on parliamentary elections rather than direct struggle will no doubt sound familiar to any activist today. The negative lessons drawn by reformist union and political leaders – that workers couldn’t win against the superior repressive powers of the state and its police force, that militancy would scare away most workers and supporters, and most of all that elections and parliament are the most effective arenas to bring about change – had a disastrous impact on the subsequent development of NZ radical politics. What might have been had subsequent struggles been led by a workers’ organisation with clear revolutionary politics? What if the Stalinist leadership of the CTU (who gave up the struggle against the Employment Contracts Act before it had begun) had been seriously challenged from below in 1991? Or if the struggles around university fees and the loans scheme during the 1990s had been led by activists with revolutionary politics rather than career-minded reformist student officials (who for most of that decade told us to put our faith in university management and vote for an “education-friendly” government). Much the same criticism could be made about reformist leadership in dozens of other struggles over the last century. This pamphlet is precisely what we need: more in-depth analyses of our hidden radical history, more writing on current politics from the International Socialist perspective. As well as producing work like this, we should be encouraging student members and supporters to think about writing their theses on similar topics. On the centenary of the Waihi strike, this pamphlet ensures that our working class history is a little less “hidden from history”. But unfortunately as so much of NZ’s radical past is hidden from history, readers lacking a detailed knowledge of this period are likely to struggle a little with the plethora of acronyms: IWW, NZSP, FOL, ULP, WWU, SDP, UFL, etc. A helpful addition to this pamphlet might have been a glossary of these acronyms along with a brief description of their respective organisations. Martin provides a useful list of further reading at the end of the pamphlet, and rightly singles out Harry Holland’s The Tragic Story of the Waihi Strike as the key early resource. First published in 1913, it is now in the public domain and is available in several free electronic versions, including PDF, epub and Kindle (here and here) along with at least two new print editions. Please make sure you include your address. Alternatively you can make a direct credit payment to our BNZ bank account: 02-0536-0456903-00, then email us: internationalsocialistsnz [at] gmail.com – to confirm payment and your address details.